When she was in eighth grade, kids made fun of the girl then known as Stefani Germanotta. Jealous older girls stuck in the chorus began calling her "the Germ." "They always talked behind her back, like, ‘Gross, she's the Germ! She's dirty!'" And yet! "She was always popular," says a former classmate. "I don't remember her experiencing any social problems or awkwardness." Her weight-loss methods don't sound… healthy. 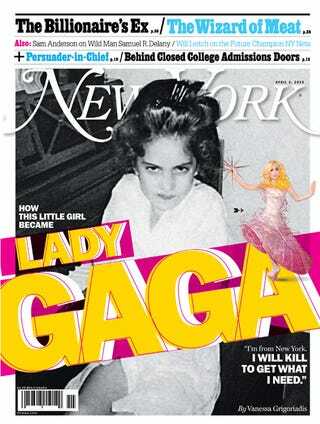 In high school, "I was fifteen to twenty pounds heavier than I am now," says Gaga. "I would wear shirts that were low-cut, and the teachers would tell me I couldn't wear them, and I'd point to another girl who was wearing the same thing. ‘Well, it looks different on her.' It wasn't fair… At that time, my breasts were much bigger, and firm, and delicious." Now she proclaims: "Pop stars should not eat," and a friend claims "dancing, diet pills, and one real meal a day was the way she finally lost weight." "Oh, cameras. I cannot bear the cameras." "Andy's books became her bible," says a friend. "She would highlight them with a pen." When she didn't think she would make it, she considered plastic surgery. "I'm getting a nose job," she said. "I'm going to get a new nose, and I'm moving to L.A., and I'm going to be huge." "Before I made my first big music video, I decided to turn that tattoo into a huge side piece," she says. "I just couldn't face the world with a tramp stamp."